to assure your WordPress site is running optimally. NOTE: Our WordPress Maintenance Plan for Premium Sites includes WordPress hosting. Be sure to click on the affiliate links below to signup and follow all instructions below. 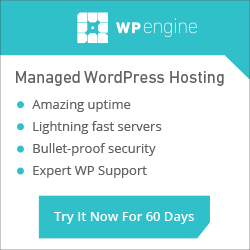 Our recommended managed hosting solution for WordPress. Typical shared hosting companies care about one thing, and that’s keeping their cost as low as possible. They may staff low-paid entry-level employees who don’t know the first thing about WordPress, and they use less-expensive servers. You may have learned first-hand that typical cheap providers will shut your site down if you get too much traffic. At WP Engine, they don’t do that. They source the fastest bare-metal hardware, then set you up on a cluster of servers with the fastest caching out there. They hire the experts—and pay them well. If you run a WordPress site and need the highest level of security, stability, and support, WP Engine is your best choice. Accounts included managed upgrades, daily backups and other optimization tools done by the web host. This only includes “core” updates. It excludes premium themes & plugins. Our recommended shared hosting solution for WordPress. Customers are not required to sign up for any contract longer than month to month service. Every web hosting plan comes with a 45 day money back guarantee, 99.9% uptime guarantee, and is fully guaranteed by the owner himself. This is a great solution if you are looking to balance quality with an affordable price. NOTE: Do not purchase SiteLock, Secure SSL or any special offers when purchasing hosting. If your account needs anything extra our team will discuss with you with specific instructions. Carefully unclick any special add-ons to avoid extra billing. Bluehost provides budget shared hosting for WordPress. I used to highly recommend them, but their service level has dropped. If you have a small website, this may still be an option for you. A web host is a company that has computers that are hooked up to the internet 24/7. These computers are called servers and they are assigned IP numbers in order that they may be found by other computers hooked up to the internet. It is on these servers that all your web files are stored. Consider the domain name the “street address” and the web host the “house”. We recommend hosting from HostGator. MULTIPLE domain names hosted at no extra cost (except for “Hatchling Plan” from HostGator). Use this to setup shortcut addresses for specific campaigns or products. I already have a web host. Am I required to change Hosting? Yes, in order to keep your costs down, Virtuallinda Media has created a standard system using our recommended host and those savings are passed on to you. In rare cases, we have made an exception, however, this means that we need to bill hourly for all servicing of your webhost. The costs to do this will quickly surpass the cost of switching to our recommended hosts. We do not recommend this, and reserve the right to turn away a project based if the hosting will we a problem since our team wants to focus our energy on building great business brands, not solving technical problems that can be avoided in the first place. Please follow the links below to signup for our recommended hosts for the easiest setup and lowest cost. You have the username, password, and contact info for your host. Your contact info on file is correct. Control panel access (username, password) to access your billing account. FTP (File Transfer Protocol) access (hostname, username, password) to copy any files on your current server. How to cancel your billing after the switch. If you have an electronic copy & printed copy of all of this information in your business records. We need to know the following information that you received when you signed up for the account. Look for “welcome to our hosting” emails. Print out a copy of these emails for your records. Your connection information to the web hosting panel (different username and password from your hosting).